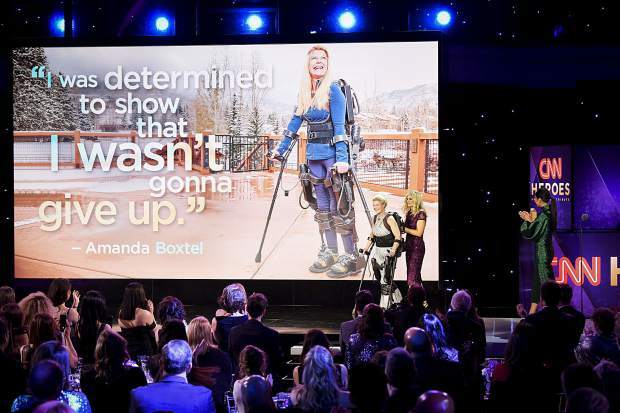 Amanda Boxtel was honored Sunday night as part of the CNN Heroes event in New York City and was able to spread the word on a larger stage of the work the Basalt-based Bridging Bionics Foundation has accomplished. Boxtel received $10,000 and was one of 10 finalists for the Hero of the Year award and an additional $100,000, and while she did not win that award, she did talk of the great things Bridging Bionics has accomplished in barely three years since she started the foundation. Boxtel, a well-known Aspen local who was paralyzed in a ski accident at Snowmass Ski Area in 1992, established the nonprofit in October 2015. She spoke briefly at Sunday’s ceremony, which was held at the American Museum of Natural History in New York. A video of the organization also was shown. “I envision making advanced technologies accessible and affordable to every person with a neurological condition,” she said Sunday night. In addition to the $10,000 cash award, each of the 10 nominees will receive organization training from the Annenberg Foundation, which among other ventures helps the development of nonprofit groups. The winner of the Hero of the Year award was Dr. Ricardo Pun-Chong, who works in Peru to give free housing and food to support sick children and their families during treatment.